I found another Chesterton book, written in 1910, in the Theology section of our Christian bookstore (that section is the smallest in the store so its not hard to spot things). The title is a good clue to the book’s contents. 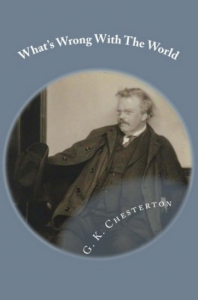 Written almost a century ago in another country, Chesterton offers unbiased yet entirely relevant insights into Christianity and culture. The reason to buy this book, however, is to have his thoughts in section three on Feminism. The issue in his day was women’s suffrage and the right to vote. His view on domesticity and the value of womanhood is presented in a truly unique way and is desperately needed in this day of whipped cream family and marriage books.